Manou in the Drôme Provençale, farmhouse in the countryside. The charm of authentic Provence, in a quiet, natural setting. Detached house, 160 m2, surrounded by a garden in the countryside, with views of the Vercors mountains and the old village of Marsanne, located 2 km. 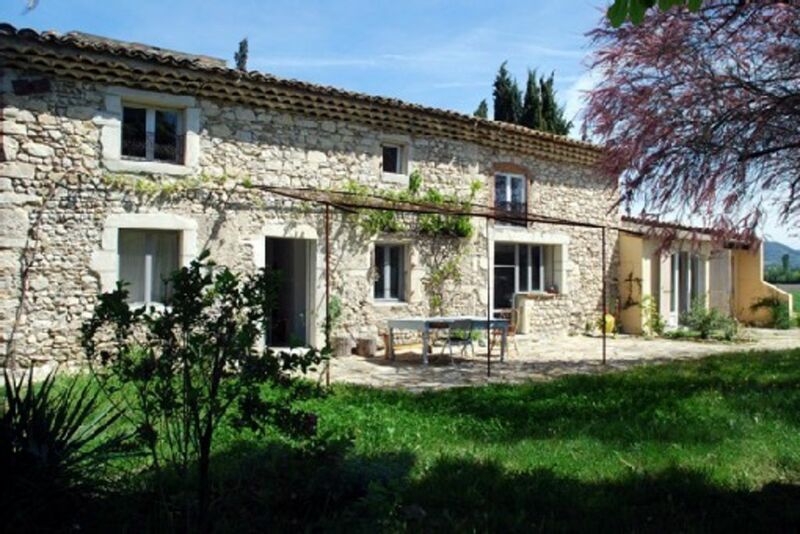 Calm, tastefully renovated, well equipped, an ideal house to relax, get together with family or friends in any season and enjoy all the possibilities of the surrounding nature and heritage of the Drôme Provençale. Ground floor: living room 27 m2 with fireplace-kitchen 24 m2-room 31 m2 with direct access to the garden terrace - shower room with Italian. Upstairs: 2 rooms 23 m2 and 25 m2 and a bathroom with toilet. The rooms are spacious and bright. A friendly terrace paved in stone, extends inside. It is directly accessible by French doors from the kitchen from the living room and the bedroom 1. She will welcome you throughout the day, whether for meals around a large wooden table with 10 people under his vine shaded vines. - GROUND FLOOR: Shower room with Italian 'Blue': completely covered, floor and walls of blue glass paste. A sink, a tiled bench for sessions being. Heated towel rail. Cupboards. Large window facing the trees. -WC Independent ground floor. -A Upstairs 'Red': A bathroom in charming decor, with a lavatory basin, bath and toilet, serving the 2 upstairs bedrooms. VMC, electric heated towel rail, skylight window. Parquet, wall tile paste red glass (see photo). Convenient storage with wooden shelf and large wash basin with black volcanic stone. Large fully equipped kitchen with wooden worktop and whitewashed walls with door to garden. Furniture combining authenticity and contemporary atmosphere. Lounge with fireplace with firewood, gas central heating, solar water heaters and gas. Spiral staircase with safety barriers. Secluded garden, away from the road, down a dirt road. Portico with games for children, built barbecue. shaded terrace. Facilities: children's books, cot, mountain bikes for 4 and 6 years (without wheels). Deck chairs, garden furniture, large outdoor wooden table on the terrace under the arbor. Exterior lighting. Possibility to install a hammock (not supplied) between 2 trees. Car Park. Malgré l'absence de piscine, cette maison, idéalement située répond parfaitement aux exigences que nous avions pour nos vacances. Chambres spacieuses, Cuisine également et parfaitement équipée sans oublier un magnifique jardin entouré d'arbres... le tout au milieu des champs. Malgré cela, la maison est située à 3kms du centre de Marsanne. Des propriétaires charmants lors de nos échanges de mails... Bref je vous recommande cette maison si vous cherchez le calme au milieu de la Drôme provençale. In Drome of Provence, between Avignon and Valence, between Marseille and Lyon. Just 15 minutes from the A7 exit Montelimar Nord. The Manu is between the forest of Marsanne and Saou forest. A 14 kms from Montelimar; 25 km from Dieulefit; 52 kms of Nyons. - Municipal swimming pool quiet family Cleon d'Andran, 3 km, municipal and charming pool 11 kms to Eyzahut. -Hiking On site in the forest of Marsanne, in the forest of Saou and in the foothills of the Vercors. -Many Cultural programs in the region and heritage to visit: galleries, artists' studios, pottery, castles, medieval villages. Les locations à la semaine se font du samedi au samedi. Les locations en week end peuvent débuter le vendredi 17h .Les charges de chauffage et de bois, de 80 € par semaine et 35 € par week-end sont à ajouter entre octobre et avril inclus. Forfait ménage de 70€ fortement recommandé, compte tenu de la superficie de la maison. Le Manou peut être loué au mois,hors vacances scolaires. Maison idéale pour une ou plusieurs familles.